Pest description and damage Adult is an olive-brown beetle with a blunt head and a tapering body about 0.5 inch long. Larvae of flatheaded borers grow to about 1 inch long and are creamy to white in color with a head wider than the body. The larvae bore into the branches or trunk after hatching and bore winding galleries along the cambial layer (between the wood and the bark). The galleries may heal, with swelling showing on the outside of the tree (lumpy bark), or they may girdle and kill distal branches or canopy. Leaves distal to the girdling may become yellow (chlorotic) and wilt. The adult beetles may feed on leaves, but cause relatively little damage. 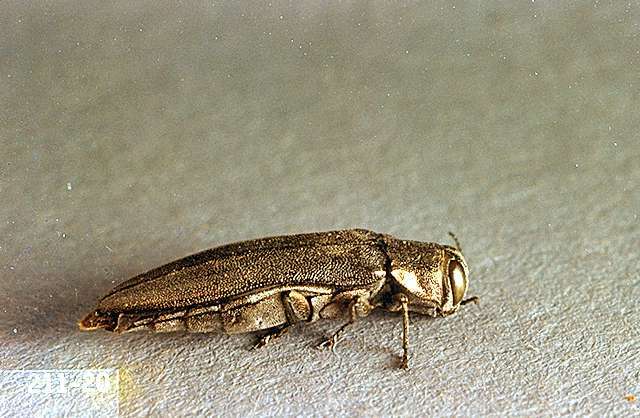 Bronze birch borers attack trees weakened by age, environmental stresses, or previous insect attacks. Biology and life history The insect overwinters as a larva in the tree. As the weather warms in spring, the larvae resume feeding. They pupate in the tree. In late spring the adult insect chews a D-shaped hole in the bark to emerge. They lay their eggs in bark cracks or under bark flaps. 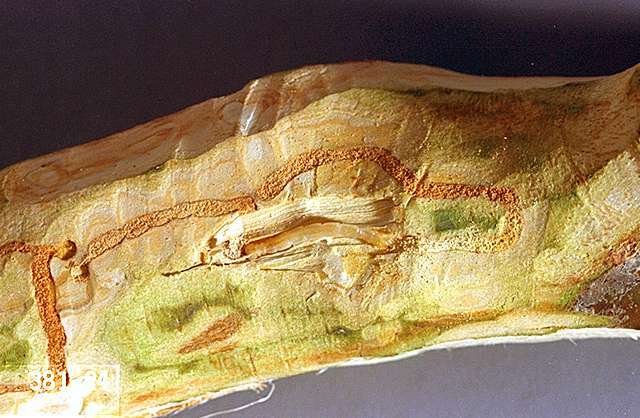 The larvae hatch and bore immediately through the bark to feed on the vascular tissues. The life cycle takes 1 to 2 years to complete. Woodpeckers feed on the larvae during the winter months. Several larval and egg parasitoids have been reported. Birch typically grows in shady, moist environments. When planted in hot, dry environments, the trees can become drought stressed and susceptible to beetle attack. Birch trees that are planted in full sun need more frequent irrigation. Borers are unable to survive in healthy trees. Keep trees vigorous with proper watering, fertilizing, and other cultural practices. In the drier regions of the PNW, plant the more resistant birch varieties and species. Susceptible birch species include Jacquemontii birch, Whitebarked Himalayan birch (Betula jacquemontii), European white birch, silver birch (B. pendula), European white weeping birch, Young's weeping birch (B. pendula 'Youngii'), and ornamental cutleaf varieties of birch. Moderately susceptible birch includes gray birch (B. populifolia), whitespire birch (B. platyphylla japonica 'Whitespire'), yellow birch (B. alleghaniensis), sweet birch, black birch, cherry birch (B. lenta), paper birch, white birch and canoe birch (B. papyrifer). Those with low susceptibility (more resistant) include heritage birch, heritage river birch (B. nigra 'Heritage'), river birch and red birch (B. nigra). Do not prune when adults emerge and seek oviposition sites (late April to mid-July) as the females are attracted to fresh cuts.